I never saw the original Bad Moms, though it's worth noting that the synopsis on Wikipedia makes it sound as though it has something resembling an actual plot, which already sets it above its holiday sequel. Usually, when I say a movie is difficult to describe in terms of genre, it's a compliment. In most cases, I'm saying a movie transcends boundaries or exists in its own space. Sadly, that's not the case here. 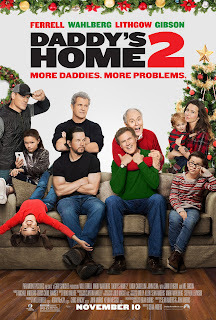 A Bad Moms Christmas is a mangled mess of tones, ideas, and tropes. It attempts to be three movies in one, and I'm not even referring to the three distinct storylines following three grown women and their mothers. That would have been a far better approach - write one woman's story as a farce, the second's as a light comedy, and the third's as a grounded drama - then play with blending these tones when the characters come together. That could have been interesting. For several years now, The Great British Bake-Off (Great British Baking Show in the U.S.) has produced special holiday episodes. Only one set of these episodes has been made easily available here across the pond that I know of. 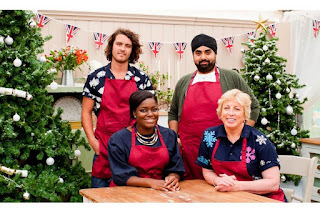 These two episodes had all the charm and warmth of the standard GBBO with a holiday flair. Each episode is a four-person competition with one winner. One episode wouldn’t be enough time to get to know new contestants, but they are all from recent seasons of the show, so it’s nice to see them again with another chance to shine. It’s not just the holiday vibe that had contestants supporting each other, admiring each other’s work, and taking pride in personal bests. This is a ridiculously feel-good show. Presented with a CG special with a cute kid and a generic title, we didn't have high hopes when we started this. However, fairly quickly we knew we were looking at something different than your average holiday fluff. 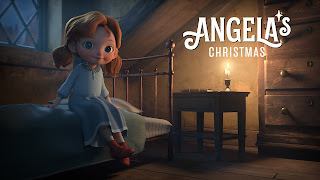 The narrator tells us that the story takes place in the Irish city of Limerick in 1914, and the adult male voice identifies a young girl as Angela, who would grow up to be his mother. Angela's family is poor, and in the opening scene the four siblings each have to pass down their coats so the baby will be warm as they head out for Christmas Eve Mass. Angela and her brother Pat fight like crazy and almost cause an accident, but the family finally reaches church. Pat continues to pick on Angela and their mother has to separate them. According to Wikipedia, the series this is from is a prequel to the movies set when Flint Lockwood was in high school, that Sam Sparks is an intern, and that the pilot implied the reason they didn't know each other in the movie was that at some point between the show and the film, Flint invented a memory eraser. We realized literally none of that while we were watching this, and it's technically a double-length episode (i.e. : a full half hour rather than the usual 15 minutes). 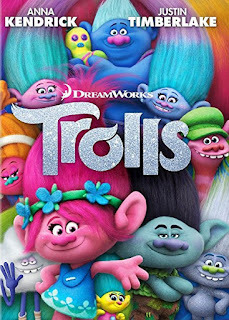 The animation is stylized to a degree that characters' ages are impossible to decipher, and the plot of this installment takes place when no one's in school. As a result, we just assumed it was intended as a sequel. Apparently not! 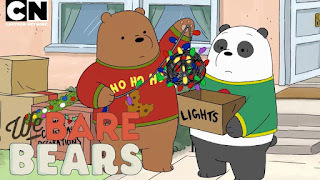 This is the second Christmas episode from the show We Bare Bears - we reviewed the first last year. Without retreading more ground than necessary, We Bare Bears is a fantastic animated show that defies easy explanation. 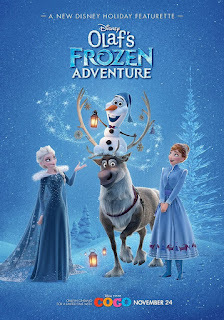 Its themes are complex and nuanced, while still being completely appropriate for young audiences. This is the kind of show that can actually be watched and enjoyed by everyone. The Perfect Tree, like most episodes of this series, is only about eleven minutes. That said, they pack a lot into that time. 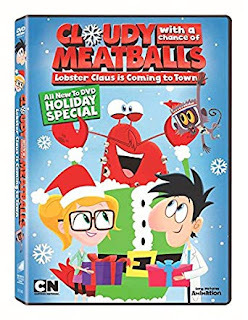 The episode opens with Chloe, a child prodigy who's friends with the bears, being given control over her family's Christmas decorations for the year. 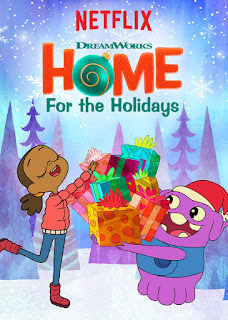 She enlists the bears' help, giving Grizzly and Panda the job of decorating the outside of her house while she and Ice Bear go in search of the "perfect tree" alluded to in the episode's title. Hey, it's a fantasy analog Christmas episode! I love those! Where to start, though. Star vs. the Forces of Evil is an animated show that I quite enjoy. The eponymous Star Butterfly is a princess from a fantasy-esque dimension. Her primary traits are recklessness, enthusiasm, and immense magical power channeled through the wand she received from her mother (Queen Moon Butterfly) on her 14th birthday. At the beginning of the series, she's sent to Earth as a sort of exchange student so she can practice her magic without burning down the kingdom. On Earth, she lives with the Diaz family and meets her best friend, worrywart/practical guy and karate enthusiast, Marco Diaz. In season three, by the time this episode takes place, Star and Marco are living in her parents' castle in the kingdom of Mewni. And it's Stump Day! 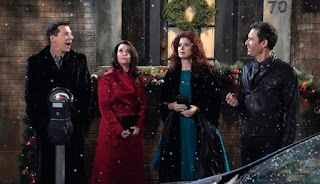 Despite being off the air for a decade, Will and Grace was recently resurrected by NBC. Let this be a lesson to you - never assume the monster is dead. Even if you think you saw its body, even if there's no conceivable way it could have escaped alive... always be ready. The Christmas episode is sort of a dream sequence/flashback to four characters in 1912 played by the cast. There's a brief frame story involving the actual characters and the bathroom of a historical society, but none of that's actually relevant. The dream sequence is set at Christmas. Karen's alter-ego is a poor Irish immigrant raising a large family in a dilapidated apartment owned by a rich landlord (Will). Jack is a sailor boarding with Karen, and Grace is married to Will. 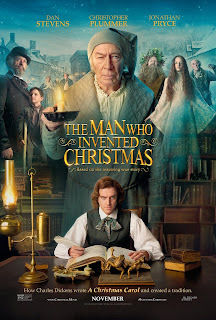 The plot basically boils down to Will wanting to throw Karen out at Christmas until Jack sleeps with him to change his mind. 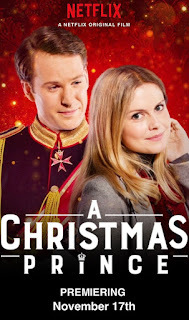 A Christmas Prince is Netflix's new tween-friendly movie that proves the internet giant is capable of competing in the crappy made-for-TV realm typically dominated by Hallmark. Personally, I kept hoping a few characters from A Princess for Christmas would show up in cameos, but no dice. Maybe they can make a sequel where their nations go to war or something - I hear shared cinematic universes are all the rage these days. You should be able to figure out at least sixty percent of the movie from the title, but I'll throw you a bone. The movie opens to a montage of New York just before Christmas. I often find myself wondering if there are film companies that send people out every time it's snowing in Manhattan in December and start filming for the sole purpose of selling that footage to productions looking for generic shots of flakes falling in Rockefeller Plaza. There must be, right? 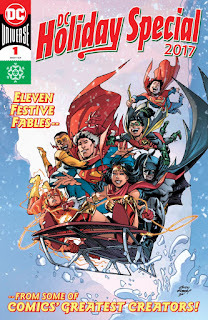 I picked up DC Comics' Holiday Special this year, but it's kind of a rip-off. Unlike the pleasant surprise of last year, most of the tales in this one feel cramped and one-note. The 90ish-page special opens and closes with a frame story of Clark Kent and Constantine in a bar, arguing with "Bibbo" Bibbowski over whether Superman (or anyone) is really making a difference in the world. Bibbo's an optimist and reassures Clark with a bunch of stories. Not that the stories which follow make any sense in that context. Most of the stories are just too short to have any impact. I was thinking that I would have rather they had cut one or two and let the others be longer. However, it's not actually that they're all short on space; some of them just aren't paced well for the space they have. Now, I like vocal music, and I like a cappella music. But when it comes to Christmas, I am over Pentatonix. They're good at what they do, but I think much of their stuff blurs together, and it's incredibly overplayed. 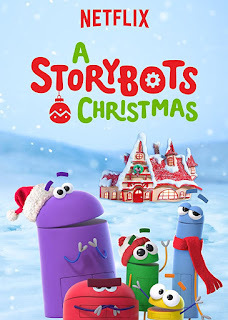 Like most variety-show style holiday specials, this was mostly boring. The opening wasn't terrible. For once, Jay Leno was actually amusing as he stubbornly refused to recognize the singers as anyone famous. The rest of the show alternated between songs on stage in front of an appropriately adoring crowd, songs on stage with guest singers, and short "comedic" bits filmed separately. New Release! I received a copy of this book from NetGalley for the purpose of review. 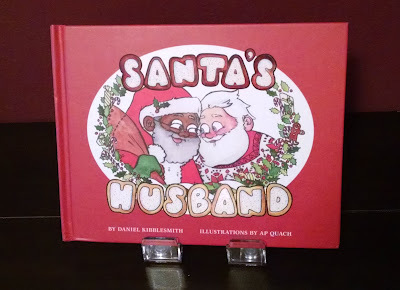 Premise: Five stories of love, hope, and forgiveness at the holidays. Do you need some warm and fuzzy holiday cheer? Do you love love? 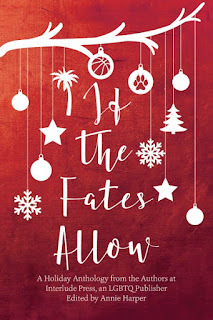 This new collection features five LGBTQ holiday romances that make your heart feel full of sugarplums. I smiled and sighed and giggled. It's seriously sweet, without being too sweet. The first author, Killian Brewer, starts off strong with "Gracious Living Magazine Says It Must Be a Live Tree." Marcus wants his first Christmas with his boyfriend to be perfect, and his grandmother's friends are there to help. "True North" by Pene Henson follows a WNBA star who goes home for the holidays with a friend, only to navigate her family's misguided assumptions and her high school crush. 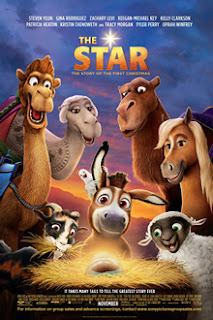 I have never seen the Dreamworks animated movie Spirit - Stallion of the Cimarron, but Wikipedia tells me that the point was that it was about a horse whose rightful place was running free, untamed by man. 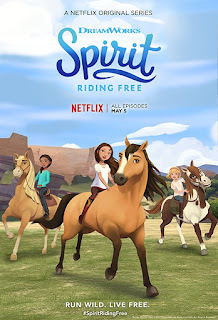 So I'm not sure why the Netflix spin-off series follows a girl who befriends a wild horse (also named Spirit) such that he follows her around and hangs out in town all the time. Seems... wrong. But hey, there's money in dolls that ride horses. We also couldn't figure out when this takes place. The lack of cars, one-room schoolhouse, and prevalence of farming seems to imply a vague "frontier" time, but the clothing and the writing seemed plausibly modern. Based on this episode, we decided that it could take place anytime between the 1880s and the 1980s, but if someone pulled out a cell phone, we wouldn't be that surprised.